It’s time for me to bring the series I’ve been doing on a a toy at CNNMoney to a close. Previous installments have covered housing payments, emergency funds, asset allocation, buying your employer’s stock, and life insurance. This final installment is on the topic of the last question in the CNNMoney "How Healthy Are Your Finances" quiz, retirement savings. Like all the other questions, this one has you type in a number or two and gives you a red "Danger" or a blue "Congratulations" for your trouble. The question asks for monthly savings and how much you have already saved. I found that, having previously said I was a 40 year-old making $50K a year, with $10K already saved, if I put in $750 of monthly saving I get the pat on the back but at $700 I fail. Given the number of variables, I don’t have the patience to back out what rule the toy is using to divide the ants from the grasshoppers. And it doesn’t provide that rule in the explanation of how you did, leaving a user only trial and error to find out what good is. That leaves something to be desired in the way of actionable advice. But to its great credit, this is one area in which the toy concedes that a simple rule is not appropriate. It depends on a lot of things, like how much of your "pre-retirement income" you expect to draw each year after you quit working, how much your nest egg will continue to grow, and how long you’ll live. Of course, this leaves much unexplained, starting with what sense of irony is intended by the quotes around "pre-retirement income". But this text should be enough to tip off any intelligent reader that taking advice on retirement savings from a bit of Java code is not the wisest course of action. 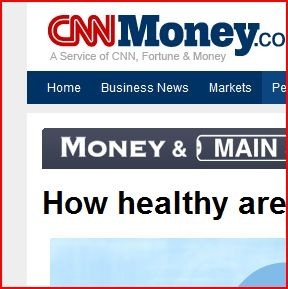 I cannot bring myself to contemplate if there are people out there who would change their behavior based on a CNNMoney quiz. I’m happier if I just don’t think about it. But simple toys like this have a certain widespread appeal. For me, that fact epitomizes one of the great problems we have in our popular personal finance culture. We have a desperate need for things to be reduced to very simple terms. It goes beyond the dumbing-down of the material. It is a basic denial of the objective fact of the complex nature of personal finance. Some things just don’t lend themselves to being dumbed-down. We would all be happier if personal finance was simpler (although not if that was because we were poorer) and quite a bit of the complexity is ultimately unnecessary (e.g. the tax code) but the unavoidable truth is that right here and now it is complex. Deal with it. I think this is part of a larger societal trend I am dubbing The Twitterization of American Discourse(TM). It is the trend that has us increasingly believing that any problem or argument that cannot be described in 160 characters or less is not legitimate. No matter how subtle, complex, or ambiguous the topic, in order to discuss it, it must be encapsulated into a single evocative word or phrase, such as "war on drugs", "global warming" or "Wall Street bailout". Long-winded objectors who argue that these sorts of things just aren’t that simple, and that calling them by these names may be misleading, will be shouted down. And, of course, what is really brilliant about my newly named concept, The Twitterization of American Discourse(TM), is that it describes itself. what is really brilliant about my newly named concept, The Twitterization of American Discourse(TM), is that it describes itself. The root problem is a feeling that marketing justifies anything. There has always been a great demand for short and sweet tips. The difference is that in earlier days there were limits to how misleading we were willing to be in the money advice we gave. And they are indeed popular. Get Rich Quick schemes are always popular. We need something on the other side to balance the marketing focus. It used to be something called “ethics.” But there are many today who do not feel comfortable saying that ethical considerations should ever outweigh marketing considerations. The reality is that markets cannot exist without ethics. Ethics comes first and marketing considerations second. It’s not good marketing to even make that point today. But I believe that it will become more popular as our failure to make it causes even more financial misery. I sure hope so! There is nothing as “practical” as ethics in the long run. I found I was in danger if I contributed 1208 monthly, but safe if I contributed 1209. Who said every dollar doesn’t count? Gotta stop buying that latte every morning, I guess. (And I don’t even buy lattes.) Trouble is, I’ve used some dozen on-line retirement calculators, and each one gives me a different result, with some favorable and some unfavorable. How can you trust any of them if you don’t even know if they’re taking into account such crucial factors as inflation or social security? Sorry to burst your bubble, Frank, but the Money Tool caused me to rethink my retirement portfolio and I changed the allocations to look more like what they were suggesting. I don’t regret it (yet!). It might have been very good advice. You’re buying low rather than high. Two years later at the end of 2009, the Dow is back to 10,000+.